It was one of those moments we all will remember as wrestling fans. 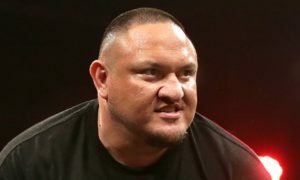 Samoa Joe attacked Paul Heyman, and in doing so, he became the baddest man in WWE and also became the company’s next incarnation of Brock Lesnar. How fitting that Joe, who won the Extreme Rules “Fatal Five Way” match, waxed profound about how he wanted to be just like the current Universal Heavyweight Champion. 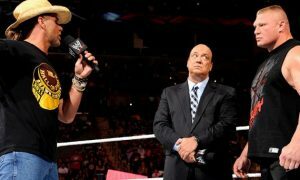 How he wanted the schedule, the title, the time off from the business and yes, even Paul Heyman as his advocate. And how fitting that he sent a message to the man he most wanted to emulate in the only way he knew how – to put Heyman in the Coquina Clutch, like a savage looking to kill his prey. 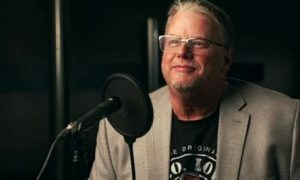 Since his arrival on the main roster, Joe has been the mercenary Triple H envisioned him to be – attacking Seth Rollins, making a joke out of Sami Zayn, and jumping into the main event scene out of desire, much less so than necessity. If there is a man on the current roster who matches up well with Lesnar, once viewed as the baddest man on the planet, it’s the former TNA World Champion and former NXT title holder. And for the first time in a long time, WWE has what it wants – a match that will live up to its billing after a slow five-week burn. The wrestling business isn’t built for longstanding feuds like Tommy Rich and Buzz Sawyer in decades past. But in this instance, two super heavyweights will collide with the future on the horizon. For Joe, this is the moment he has worked for, the one he dreamed of when he originally signed with WWE and worked in NXT to perfect his craft, to create the perfect storm. Three nights ago, we all worried what would happen to the main event picture because Braun Strowman wasn’t attacking Roman Reigns. Now, fans like myself might be asking the same question in five-plus months. This was the plan all along. Yes, Finn Balor would have been the “easy” opponent, which may also have led to the creation of the Balor Club that included Karl Anderson and Luke Gallows. Roman Reigns would have made sense, but the WWE fans would have walked out in revolt. The idea of Bray Wyatt and Lesnar has long been teased, and would have been a treat to see Heyman and Wyatt trade verbal barbs. Rollins would have been as popular as Balor with the faithful, but revisionist history says to leave well enough alone. No matter where he has been – the independent circuit, TNA or NXT, Joe has left everyone in his wake. He was bigger, meaner, stronger and just better. 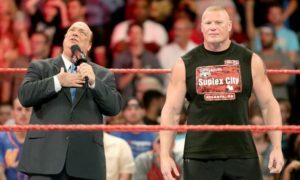 Those were the same things we said about Lesnar, who stood head and shoulders above almost everyone in the company that helped to make him a beast. Joe walks into a ready-made situation where he can thrive and give WWE something it desperately needs – a champion that shows up every Monday night and wrestles. Suddenly the “New Era” looks a lot like the “Attitude Era” with all the bullying and brash posturing. I applaud WWE for making this happen and thank the wrestling gods for not putting the diminutive Balor in the main event at the “Great Balls of Fire” pay-per-view. There are many plots and subplots that could come from this kind of confrontation – I’ve thought of plenty of them while writing this piece. Each one, I am sure, will be examined. All of them are plausible. 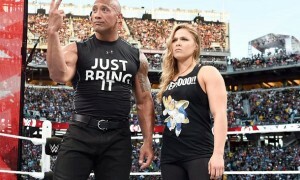 But in the end, WWE has created a super main event for Raw’s next pay-per-view. And the probability of the crowning of new beast on top of the company ladder.